Antalya branch chair of CHD – Progressive Lawyers Association; lawyer Deniz Yıldırım who was detained on 11th August 2017 with other lawyer Ramazan Gokalp, was arrested, on 25th August 2017. Lawyer Ramazan Gokalp was released with probation. Within scope of same investigation 4 Kurdish local politician also were arrested. Lawyer Deniz Yıldırım is 524th Turkish lawyer who have been arrested since 15th July 2016. Human rights defender and lawyer Nalan Erkem who was arrested along with other 7 human rights defenders within scope of sham investigation in Istanbul, had a gastric bleeding in Silivri Prison. Whilst she suffers of life-threatening gastric bleeding, she was transferred to the hospital in Silivri Prison campus with handcuff and kept with handcuffs during medical examination. Despite lawyer Erkem suffers of ongoing gastric bleeding and so needs a comprehensive medical care, She won’t be able to go a surgical hospital until 1st November 2017 due to alleged workload. Lawyer Murat Dincer who represents Ms.Erkem said that criminal complaints will be made regarding ill-treatment and inadequate medical care. Lawyer Özge Elif Hendekçi, member of Istanbul Bar Association, was detained with a police raid in 2.30 am on 17th August 2017; although she has been at 8th month of a risky pregnancy. Lawyer Hendekçi was released with probation after 5-day police custody. Lawyers Ayşegül Çağatay, Ebru Timtik, Didem Baydar Ünsal, Mehmet Refik Atay, Naim Feyzullah who represent dismissed public servants Nuriye Gulmen and Semih Ozakca, were taken into custody infront of The State of Emergency Inquiry Commission building in Ankara, when they went to submit petition on behalf of Gulmen and Ozakca. They were released after brief custody. Ozakca and Gulmen are on hunger strike for more than 100 days and were arrested only because of peaceful hunger strike action. There has been a relentless campaign of arrests which has targeted fellow lawyers across the country. In 77 of Turkey’s 81 provinces, lawyers have been detained and arrested on trumped-up charges as part of criminal investigations orchestrated by the political authorities and conducted by provincial public prosecutors. 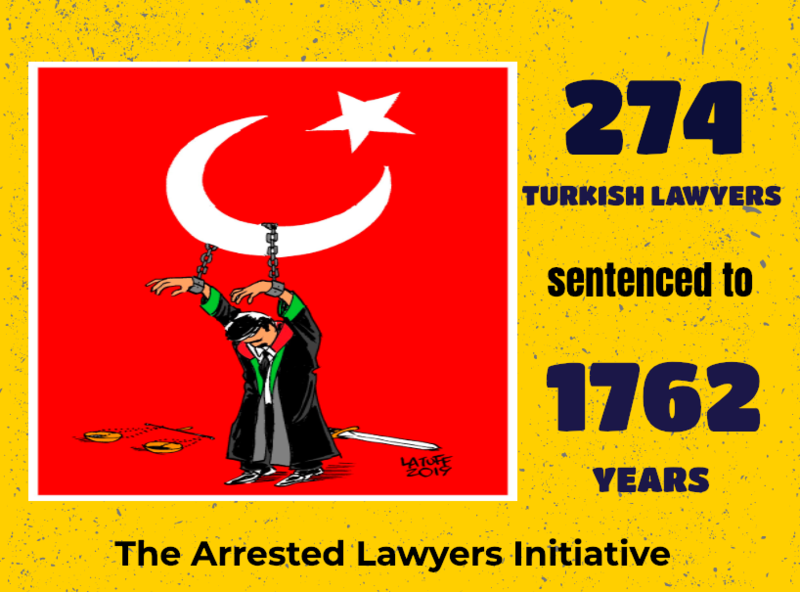 As of today, 524 lawyers have been arrested and 1318 lawyers are under prosecution. On the week of 14-18 August; one lawyer was arrested, 4 lawyers were taken under custody and still being held, 60 lawyers were on trial. And this week (21-25 August), one lawyer was arrested, one lawyer was released with probation, 6 lawyers were taken into custody. The Turkish government has also targeted Turkish lawyers’ right to association. 34 different lawyers’ societies or associations have been shut down since the declaration of the state of emergency. Following their closing down by a government decree, all their assets have also been confiscated without compensation.